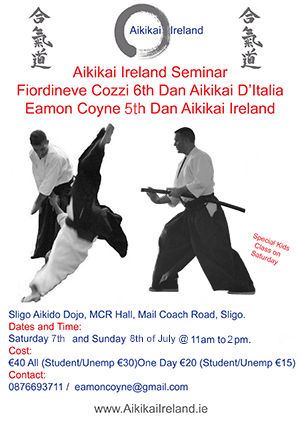 Saturday 7th and Sunday 8th of July Fiordineve Cozzi 6th Dan Aikikai D'Italia / Eamon Coyne 5th Dan Aikikai Ireland seminar in Sligo. 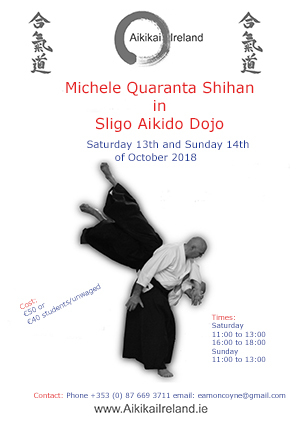 Sligo Aikido Dojo will once again have the good fortune to host Fiordineve Cozzi Sensei 6th Dan Aikikai D'Italia and his lovely wife Rosella Lamboglia 4th Dan Aikikai D'Italia and some of his students from around Italy. 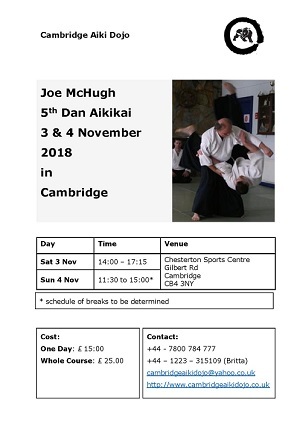 The seminar will also be taught by host dojo instructor Eamon Coyne 5th Dan Aikikai Ireland. 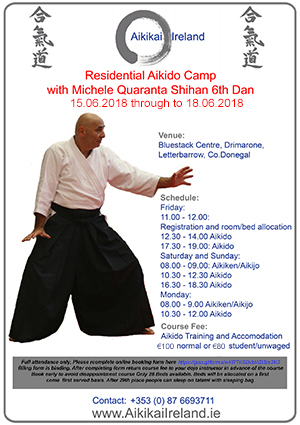 Fiordineve Cozzi Sensei is renowned for his kids classes and is responsible for the Aikikai D'Italia kids programme DVD and will give a special kids class at the seminar in Sligo too. .
€100 normal or €80 student/unwaged. 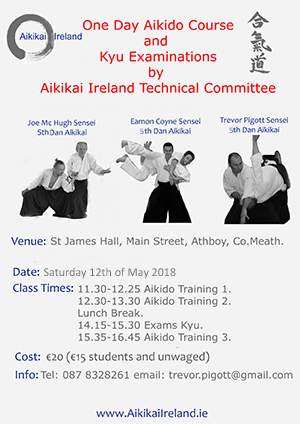 On Saturday 12th of May Athboy Aikido Dojo will host a seminar which will be given by Aikikai Ireland Technical Committee members Joe McHugh 5th Dan, Eamon Coyne 5th Dan and Trevor Pigott 5th Dan. St James Hall, Main Street, Athboy, Co.Meath. 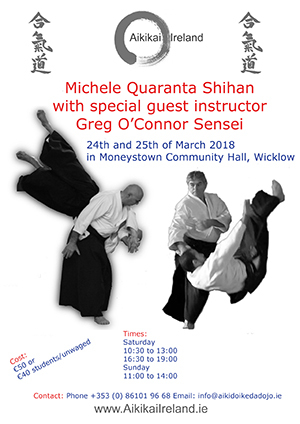 Aikikai Ireland Technical Adviser Michele Quaranta Shihan 6th Dan will give another Aikido seminar in Moneystown Community Hall, Wicklow on the 24th and 25th of March. Also teaching at this seminar will special guest Greg O'Connor Sensei founder and Chief Instructor of the Aikido Centers dojos (www.aikidocenters.com), we have had the pleasure of Greg last year at the residential camp in Donegal, looking forward to seeing Greg again. This will be first of three seminars during 2018 with Michele Shihan.